Create your own top site or top-sites, and get other webmasters to send you free website traffic. Note: Our company (Answers 2000 Limited) is the developer and vendor of this product. This script allows you to set up your own top site which other webmasters can join and list their sites. The more hits ("votes") they send you, the higher up the results their listing goes, and in return the more traffic they tend to get back. Create a top site on any topic that you like. Run one or more top sites as part of your web site. Optional "site of the moment" feature. Members area for webmasters who join. Manual or automatic approval of new members. Optional email notification to the administrator when new members join. Password protected administration and management tools. Ability to ban words or URLs. Full documentation and installation instructions included. Our company, Answers 2000 Limited, is the vendor of this Top Site PHP Script, and we sell this product exclusively through ClickBank. 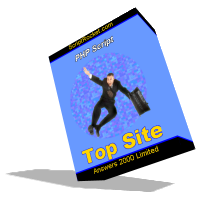 You can purchase Top Site PHP Script using most major credit and debit cards, or by using PayPal. Although some payment options may not be available for all customers. Shopping with ClickBank is safe and secure. Allows for the return or replacement of any defective product within 60 days from the date of purchase. When purchasing, please review the conditions of sale for most recent and complete information. Disclosure: Our company is the developer and vendor of Top Site PHP Script.